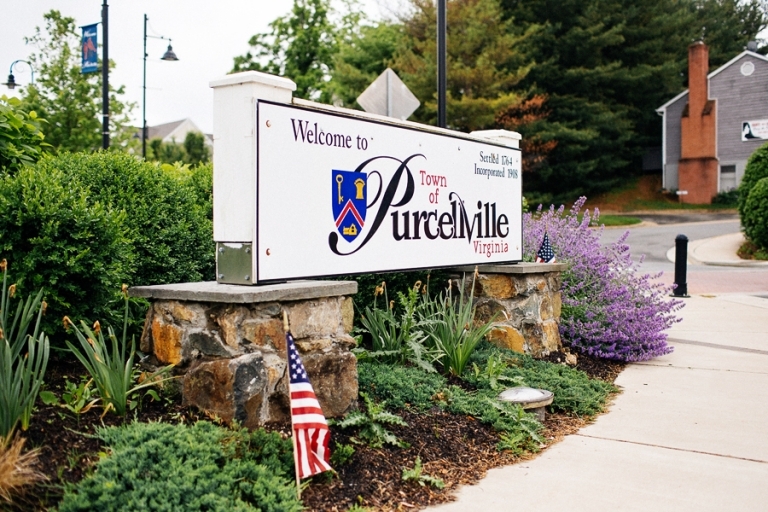 Hey local friends – did you know that there are several fantastic craft breweries in the heart of Purcellville, Virginia? Chris and I recently tried a few of them, but first…here’s the story of how we ended up gallivanting around this charming town in the middle of the day on a Thursday. We bought tickets for an Orioles game back in April and had planned to make a Saturday of it in Baltimore, including a trip to the aquarium and one of our favorite restaurants. Unfortunately, we found out the night before that there were planned protests that same day, so we decided it would be best not to go for various reasons (traffic, parking, safety, etc.). According to the news, that turned out to be a very good decision. We assumed we’d have to eat the cost of the tickets, but we received an email from the Orioles stating that since we “may not have had the premier Oriole Park experience,” we were eligible to receive complimentary tickets to a another game this season. Awesome! Out of the games available, the best option for us was on a Thursday so we took time off from work. Sadly, that day turned out to be quite rainy and unusually cold, so once again we decided not to go. Womp womp. We came up with an alternate plan for our day off and chose to spend the day touring some local breweries instead. It was the perfect way to spend time indoors avoiding the dreary weather. 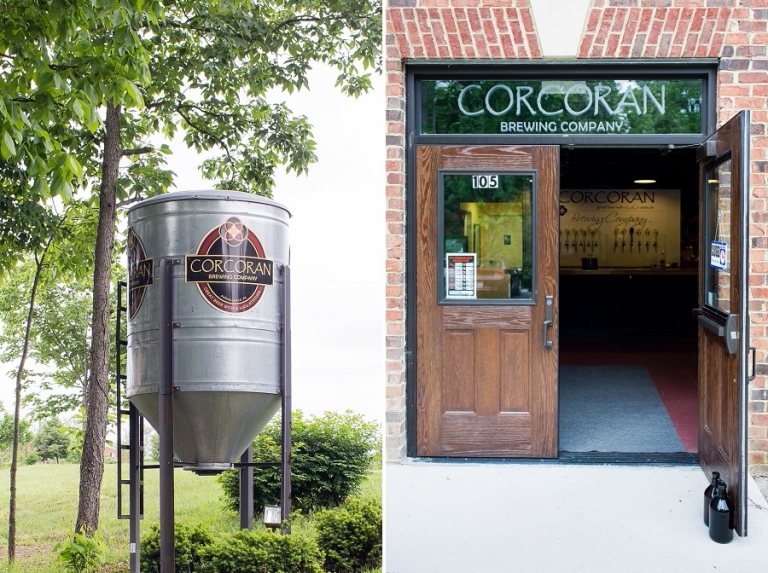 First up was Corcoran Brewing Company, located at the corner of Hirst Road and North Hatcher Avenue. A glance at Google maps shows that they’re also near the W&OD Trailhead, so I suspect we could easily ride our bikes to the tasting room on a nicer day. We’ll have to try it sometime and report back. We showed up to the tasting room right as they opened at 3:00pm, so other than a handful of patrons in the outside seating area (who might have also been playing hooky? ), we had the generously sized space to ourselves including unlimited use of the foosball table. It was there in the Corcoran tasting room that I discovered I am terrible at foosball. The staff on deck were super friendly and knowledgable, and made helpful recommendations. According to the Corcoran website, they offer live music and other events and I’m quite sure there is normally a much livelier atmosphere if you don’t show up in the middle of a workday. Corcoran is kid- and pet-friendly, too, so feel free to bring your two- and four-legged children. We noticed a canister of complimentary dog treats available for the latter. From the Corcoran website, they “strive to create both traditional beer types as well as creating unique experiences with experimental beers.” The tap lineup included a substantial array of hand-crafted beers ranging in style; they truly do have something for everyone. At the risk of losing my credibility for writing a blog post on the topic of beer, I have a confession: I’m not a beer drinker. I tend to gravitate toward vodka and rum-based drinks. And margaritas. And liquors. And wine on occasion, so I’m not at all a teetotaler. Chris, however, loves beer and I tried all of his samplers. If nothing else I could appreciate the variety available. Chris ordered two flights of five beers each (flights of five 3-ounce samples were $9) and taught me about the classifications for color and bitterness. We both picked an American Hefeweizen as our favorite, and would happily return to Corcoran for another visit and a foosball rematch. By this point in the afternoon, post-workday happy hour was getting started so we found ourselves among several other patrons in the cool industrial, art themed tasting room. It was a little too chilly to sit outside, but I can imagine how good it feels to enjoy a drink on the patio when the weather is nice. I tried all of the samples that Chris ordered, and out of the six he selected my favorite was the citrus-based G/I/A/A. Of note, the current selection on tap seemed to lean towards a higher ABV. 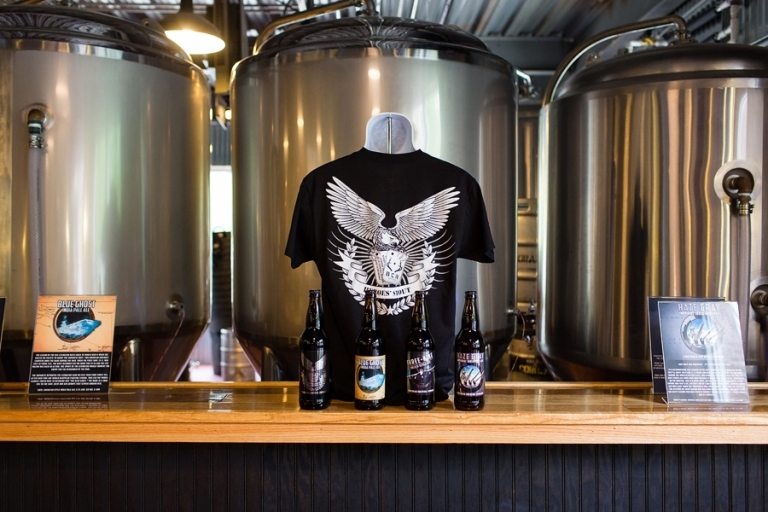 Check out the website for extensive background information on each beer including tasting notes, pairings, and even a statement about the artwork on the bottles. There are a few brown beers listed online that Chris wanted to try, but they weren’t in rotation on tap during our visit. We’ll definitely go back sometime to give those a try. We ended our tour at our third stop, Belly Love Brewery & Taproom right off of Main Street. Their location is tucked away in The Shoppes of Main & Maple shopping center, so if you miss it at first like we did, circle back and wander down this nook between Auto Zone and Coney Island Diner. Chris and I were happy to discover that Belly Love offers a menu of snacks and small plates because we were getting hungry. Sampling beer is hard work! We shared a warm soft pretzel with beer cheese and spicy mustard, and it hit the spot. At this point we had tried seventeen different beers and just didn’t have room for another flight, so we’ll have to go back and get a better feel for what Belly Love has to offer. We tried the American Cream Ale as our eighteenth beer and called it a day. Note: Eighteen beers might sound a wee bit excessive, but they were all little 3-ouncers except for the last one so it was roughly the equivalent of four pints. Also, I took teeny tiny bird sips because that’s all the beer I can handle without making a face, so I made for a very sober designated driver. Drink responsibly! The Belly Love tasting room has a warm, cozy atmosphere with plush seating areas and a long bartop with a row of beautifully framed taps as the focal point. There is a small seating area out front as well for days when the weather is cooperating. 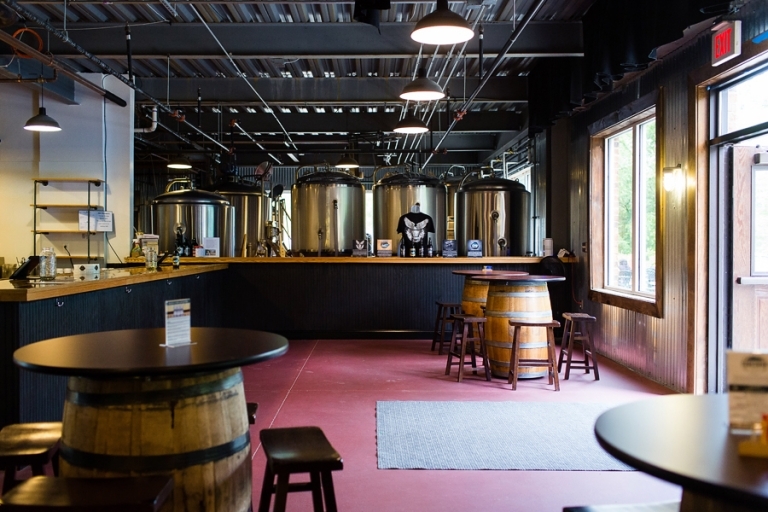 So there you have it, our self-selected self-guided, tour of breweries right in Purcellville. Chris and I liked each of the tasting rooms for different reasons: the laid-back vibe and variety at Corcoran, the gritty atmosphere and creative crafts of Adroit Theory, and we enjoyed lounging and noshing at Belly Love. The locations are super close in proximity and it’s easy enough to make an afternoon or evening out of your own tour (we spent about 3.5 hours altogether). Let us know if you go and tell us which one is your favorite. Cheers! Susan - Thanks so much, Matt! And thank you for the guide – it’s a huge help! We’ll definitely use it to check out the other nearby breweries.